Tired of regular old pork, chicken and beef? Looking for something a little more on the wild side. Well, listen up. We've got a couple of suggestions for you. They are as different as night and day and right here in North Alabama. The first one is called The Hunt Club Subs n Grill and it has been in operation for about three years. It is located in Madison and it is a laid back burger joint with a twist. The menu has all the usual suspects, burgers, dogs and wings, but you have choices. You can order a regular beef hamburger, but you can also choose to have your burger made with elk, venison, boar, bison, kangaroo or antelope. Those dogs? Well, you can choose the all beef variety or you can go a little crazy and get reindeer, elk, rattlesnake or rabbit. Are nachos your jam? You can have those with beef or any of the wild game options. You can begin your meal with an appetizer of fried gator bites or a bowl of bison chili. They also have a sub sandwich made with buffalo. We had no idea what to expect when we went for dinner one Friday night. We got there right at 6 and were immediately seated, but the place filled up pretty quickly after that. After studying the menu and quizzing our server, we finally made our selections. I opted for the Alaskan reindeer brat with Coca Cola onions, spicy relish, creole mustard and a side of redneck fries, which are just regular fries with a spicy Cajun seasoning. I loved my reindeer sausage, it had the snap you get in a good sausage or wiener. I especially liked the Coca Cola grilled onions. They were delicious on my brat. I am really glad they served the relish and mustard on the side, because that relish was TART! A little too much for me. And the mustard? Wow! Let me just say a little goes a long way. Use sparingly! Scott decided on the elk burger, but not their most famous one called the Bama Buck which comes topped with quail eggs, sautéed mushrooms and onions, pepperjack cheese and cherrywood bacon. None of those were on Scott's burger, just catsup, mustard, onion, lettuce and tomato, thank you very much. He also got regular fries instead of the spicier fries. The man is afraid to venture too far out of his comfort zone. Heads up on the elk. It is delicious, but very lean. If you like fattier burgers, elk might not be the best choice for you. The total cost of our meal was around $38 including tax and tip, which we thought was very reasonable. Hunt Club is a great choice if you are curious about wild game, but aren't too sure how much you will like it. You can taste some different things without breaking the bank. The next North Alabama option for wild game has only been opened for four weeks. 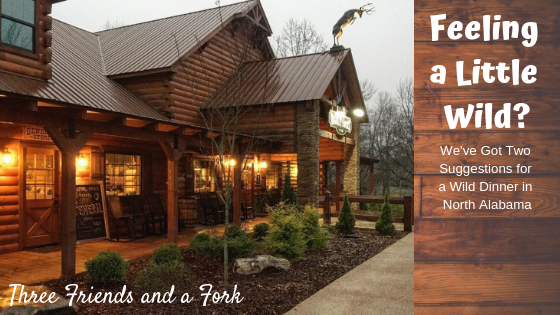 It is called Bama Bucks, located on a farm in Sardis, is more upscale, but in a rustic, not fancy way and only open on Thursdays, Fridays and Saturdays. Heads up. Fridays and Saturdays have been covered up, so expect a wait if you show up right at dinner time. They are also open at lunch and if you go then, you will have an opportunity to see more of the live animals on the farm. No, these are not the animals you eat. The kangaroos, reindeer, camels and other live animals are there for your enjoyment and education. My friend, Tina and I went on a Thursday night right at 5:00 and we were seated right away in what I thought was the best seat in the house, right at the back of the restaurant near the bank of windows overlooking the farm. Even though it was dark outside, we still got a bird's eye view of some of the reindeer and fallow deer behind the restaurant. Our server was super helpful and full of information about the food, the animals and the farm. The owner, Terry Turk, also stopped by our table and we got to ask him some questions about the whole operation. We really liked him and decided he reminded us of our favorite principal, Steve Green. You remember him from Three Friends and a Faculty. Terry obviously is a real outdoorsman, just like Steve. He was even dressed like Steve, jeans and a cowboy hat, although Terry's hat was more like the Crocodile Dundee version. I am suspecting the major difference is that Terry will eat a greater variety of things than our friend Steve will. If Steve came to eat at Bama Buck's, I suspect he would be ordering something from the less adventurous side of the menu, possible the chicken fingers from the Fawn's (little kids) menu. Just kidding, Steve! You know we love that about you! Anyway, we started our meal with the corn fritters served with spicy slaw and a creole ranch drizzle. We really, really wanted to try the wild game sausage trio or the duck blinds, but since there were only two of us, we figured we wouldn't want anything else to eat if we started with one of those. The fritters were very good, not greasy or dense at all. I would have liked the slaw better if it hadn't been warm, but that's just me. Tina had already studied the menu and had settled on some root beer glazed short ribs. I'm not a root beer fan, but I would not have known root beer was the ingredient giving them the slightly sweet, very good flavor. Our server, gosh I wish I could remember his name, told us the short ribs were one of the items they were considering taking off the menu. They are still tweaking the menu as they learn what people like. Tina told them they should reconsider that. She loved the ribs. They also told us they were thinking of exchanging their delicious, crusty bread for a softer roll. They said people actually think the bread is stale because it isn't soft. Too many folks growing up on brown and serve rolls from the Piggly Wiggly! I hope they don't replace that bread! For my entree, I decided on the roasted pheasant breast. The best meal I have ever had in my life was an African pheasant from Bones in Atlanta. It has been so long ago, I can't remember how it was prepared, only that I loved it. I don't know what kind of pheasant I had at Bama Bucks, but I can tell you I ate every bite. It was tender, not gamey or dry at all. The pheasant was served on a wild rice pancake and topped with berry ( I can't remember if it was blackberry or raspberry) brown sauce. It was served with steamed asparagus and everything was delicious. Our server should be given a raise, because he sweet talked us into ordering not one, but two desserts! First he told us how good the key lime pie was and then he blindsided us by telling us we had to order the berry chimichanga! He knew a couple of dessert suckers when he saw them. He was right on both counts. The key lime pie was not too sweet, not too tart, just right, Goldilocks. The deep fried chimichanga came with ice cream and whipping cream and was delicious as well. We both thought our bills were extremely reasonable. With an appetizer, entree and dessert plus tax and tip, each of our totals were under $45. I really hope people around the state will continue to support this restaurant. It is an incredible addition to dining in Alabama. It's kind of off the beaten path, but not far off highway 431 in Boaz, and Google Maps takes you there with no problem. We will definitely be back! One other thing. we learned lots about the animals while we were eating at Bama Bucks. Our server told us all of the servers were required to be knowledgable about the animals. He told us that the mother kangaroo at the farm was ready for her little joey to get out of the pouch. Apparently the little buggers don't see any reason to vacate the premises on their own, so Terry and his farmhands have to pull the little guy out. He invited us back to see the whole operation, but since he didn't know for sure when the event would take place, it was hard to plan a trip back. I know Rob would love to help with that experience! He also told us at any given time, a mother kangaroo has four little joeys ready to be born, one in the pouch and three, like little larvae waiting their turn to crawl into the pouch. Don't tell me Alabama doesn't have variety when it comes to dining. Alabama is climbing to the top of the foodie ladder. We have always known how to prepare food so it tastes good. Now we have first class chefs bringing farm to table dining and all types of cuisines to restaurants across the state. Three Friends and a Fork give Hunt Club and Bama Bucks 3 Wild Yums UP! Check 'em out!